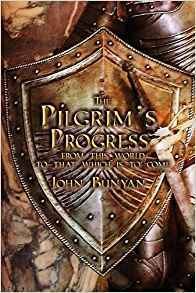 Many editions of John Bunyan’s Pilgrim’s Progress only have the first half, which follows the journey of Christian, written c. 1678. They omit the second part, written c. 1684, where Christian’s wife, Christiana, follows her husband. This edition, however, has both parts together as a single volume. Moreover, it contains the original illustrations by Frederick Barnard (which were engraved by the Dalziel brothers) and an index of Bible references Bunyan cited. These features allow the modern reader to experience the full weight of this classic allegory. Bunyan began writing this work while imprisoned for not obeying the state church in England. Still, Bunyan considered life’s trials to be mild compared to the prospect of eternal separation from God. He reminds us that we are only pilgrims here; our home is elsewhere. To get there, we must mind our step.